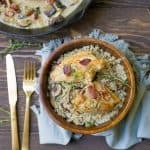 This classic French dish gets a healthy upgrade that is grain-free and dairy-free!! 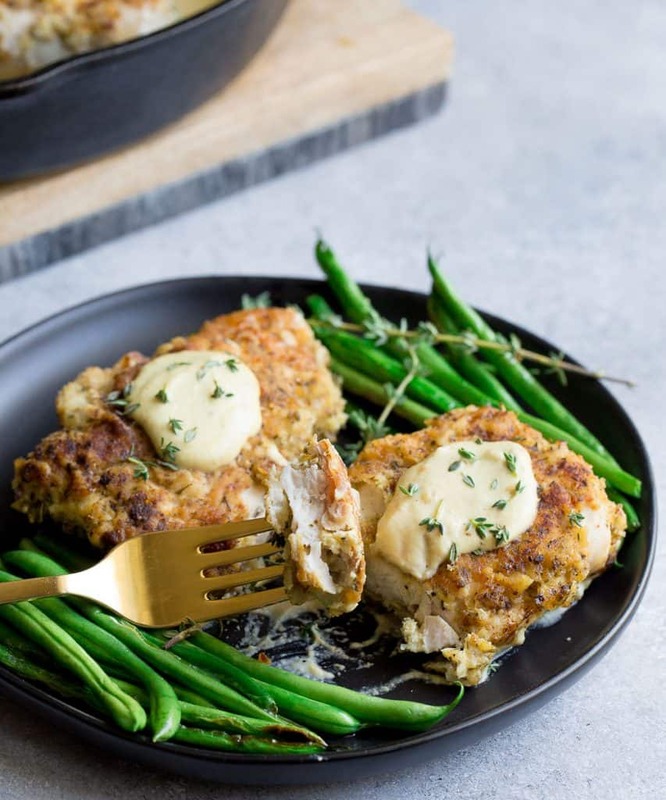 The crusted chicken is stuffed with prosciutto, and topped with a “cheesy” dairy-free cashew sauce that is so delicious. 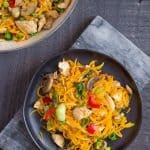 Perfect for a special occasion or busy weeknight! We’re taking a quick trip back to my childhood for one of my favorite dishes: the one I asked for every year for my birthday! 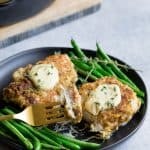 Chicken Cordon Bleu. But here’s the thing…I actually just wanted my parents to buy me the ones in the frozen section that you popped in the oven. Haha, my sophisticated childhood palate!! After spending some time with my family last week on vacation, we talked about some of our favorite foods. This one came up. And then the wheels starting……Can I make health-ify this recipe? Make it Paleo? Sure, there is always a way. A good mix of almond flour, nuts, and spices for the breading only enhanced the flavor. 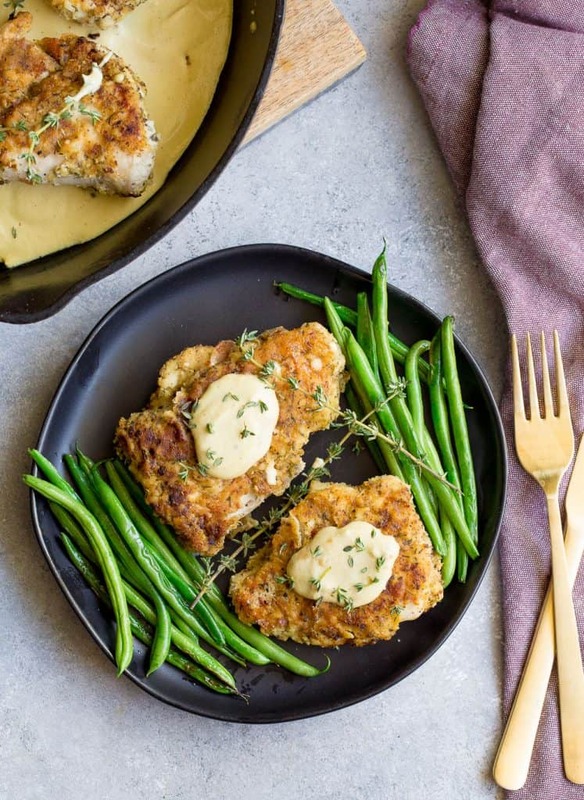 Chicken cutlets stuffed with prosciutto, and a creamy cashew “cheese” sauce completed the dish. And let me tell you guys, it’s tastier than I ever remember! I was so pumped about this dish, and absolutely loved the way it came out that I wanted to post it ASAP!!! 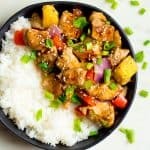 Occasionally I crank out a recipe and post right away, and this is definitely one you guys needed in your life!! So how exactly are we making this healthy? Make sure a skillet is heating up nicely before you prepare the chicken, and you turn the oven to 400. We start by pounding the chicken breast really thin and place a piece of prosciutto on top, fold the chicken. We then mix together a simple blend of almond flour, arrowroot starch, seasonings, and a few tbsp of diced pecans. You’ll create another bowl with a whisked egg and dredge the chicken in egg, then the flour mixture before transferring to the skillet. The chicken will cook a few minutes per side to get a nice golden sear. We’ll then transfer the pan to the oven and bake to finish it off. While baking, we’ll make our delicious cashew cheese sauce by pulsing the ingredients in a food processor or blender to create a creamy, thick sauce. 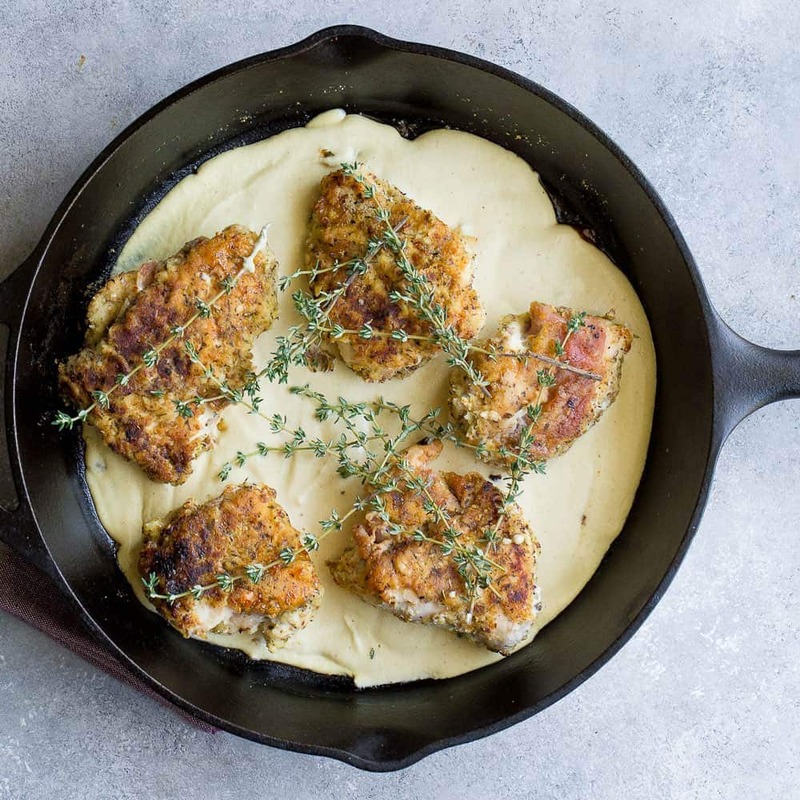 Once chicken is completely cooked, remove from the oven and drizzle the sauce in the pan to warm up. You can also spoon the sauce over each piece of chicken. Serve over zucchini noodles, or with potatoes or vegetables. Garnish with some optional fresh thyme. I can’t wait for you all to try this and tell me what you think! Preheat the oven to 400 degrees F. Heat a large oven proof skillet to medium high heat. 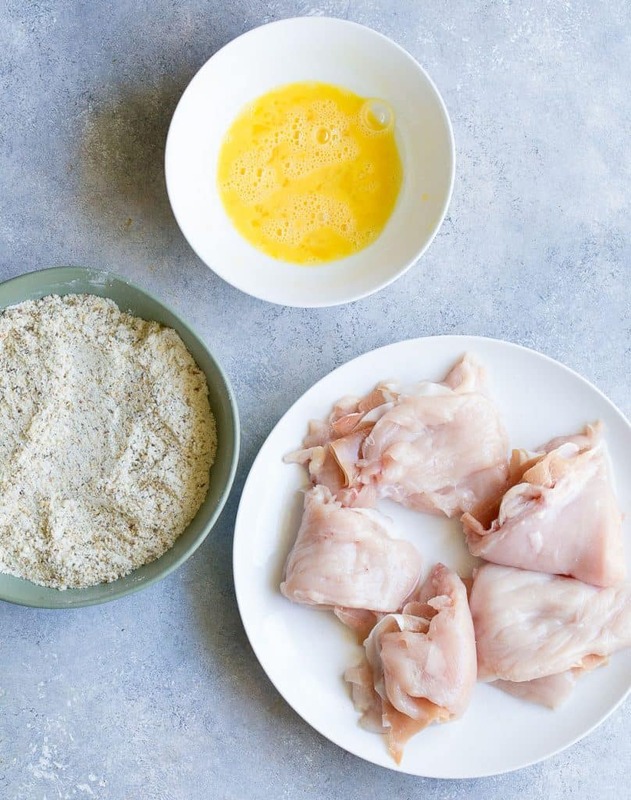 Pound your chicken breast thin to 1/4-1/2 inch, or use chicken cutlets. Place a slice of prosciutto on top of each chicken breast, and fold over. Set aside. In a shallow bowl, combine almond flour, arrowroot starch, pecans, thyme, basil, onion powder, garlic powder, and salt. In a separate bowl, whisk the egg. Place each chicken breast in the egg first, then the flour mixture ensuring that you coat all sides. Once skillet is hot, coat the bottom with oil. 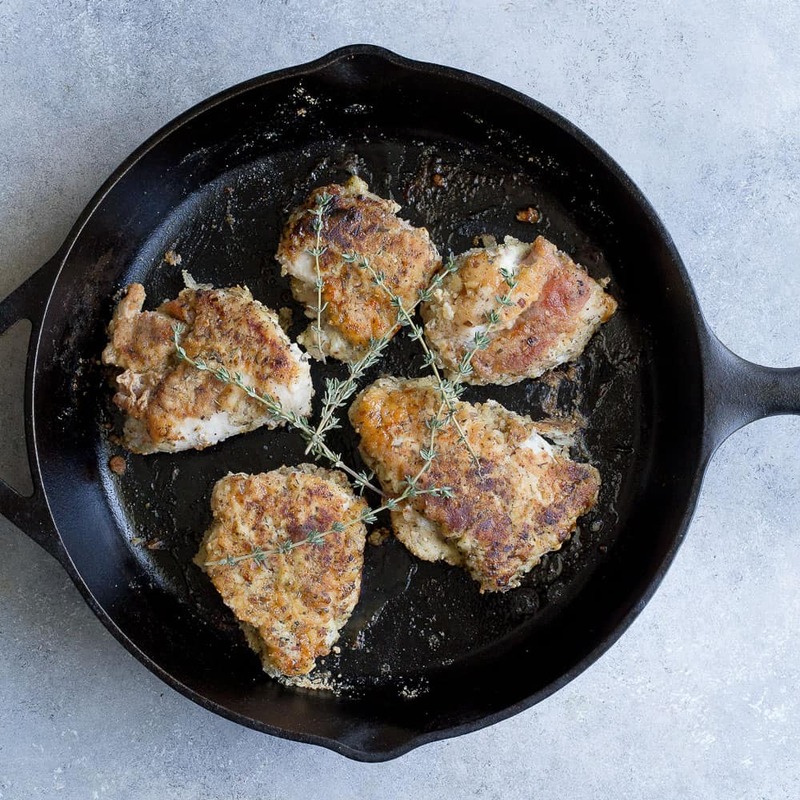 Place each chicken breast in the pan and sear for a few minutes (2-3) on each side, or until there was a golden crust. Transfer the pan to the oven. Cook for an additional 10-12 minutes, or until chicken is cooked through. Meanwhile, make the cashew sauce. Combine drained cashews, chicken broth, nutritional yeast, lemon juice, mustard, garlic, and salt into a food processor or high powered blender. Pulse or blend until smooth, pausing as many times as needed to scrape the sides. This could take 4-5 minutes. Once chicken is ready, remove from oven. Pour the cashew sauce into the pan so it can heat up. Alternatively, spoon some cashew sauce over each chicken breast. Serve hot! 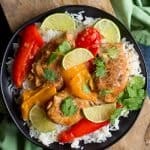 *ensure the cashews are soaked in hot water to soften for at least 15 minutes up to overnight prior to making the sauce.